Harry C. Crowell is one of the most active men in the housing industry. Since 1963, he has been the principal operating officer and stockholder of Crowell Industries. As a home builder, he has been directly involved in the construction and sales of over 10,000 residential units consisting of detached and attached single-family houses and apartments. Under Harry's leadership, nearly 1,000,000 square feet of office space, commercial shopping centers and industrial buildings have been built. In 1995, Crowell merged his home building company with John Pavekak of Century Homes and is now operating as Century Crowell Communities and together their firms have built over 17,000 residential dwellings. In 1979, Harry and a dozen other Building Industry Association members formed an insurance company called Developers Insurance Company (DICO) to provide hard-to-get subdivision bonds. Later, he purchased a second and third insurance company now known as the INSCO/DICO Group, licensed primarily to do surety bonds of all types. The INSCO/DICO Group is now licensed in 30 states and Washington, D.C. Harry is also a shareholder and Chairman of the Board of Homebuyers Guide magazine, which is published monthly in Southern California and Las Vegas. As a member of the Building Industry Association for over 30 years, Harry has served in various offices including the presidency. 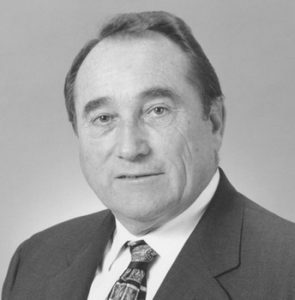 He was named Building Industry Association Southern California's Builder of the Year in 1982. Harry has also served as a Building Industry Association Trustee for Carpenters Health and Welfare and is a Senior Life Director of the National Association of Home Builders. Harry has been a Trustee on two major trusts of the National Association of Home Builders, and is Past Chairman of several committees and currently serves on the Land Planning Committee. Despite his many pressing business and professional activities, Harry still finds time to serve as a Lieutenant in the San Bernardino County Sheriff s Department Special Service Bureau, and as a Reserve Sheriffs Deputy in Riverside County Sheriffs Department. He is also a Board member of Upland Bank, Past President of the Upland Chamber of Commerce and a recipient of the Humanitarian Award from the Arthritis Foundation. ​Today, Harry and his wife Rosalynn live in Newport Beach. They have two sons, one daughter and four grandchildren. Harry's personal activities include golf, fishing, travel and a lot of family activity.